Fiat Chrysler Reports Higher U.S. Sales and Market Share - Cox Automotive Inc.
Fiat Chrysler reports earnings Thursday for its fourth-quarter and full-year 2018. Here’s Cox Automotive data on how sales, market share, incentives and prices performed in the quarter. In the U.S., FCA closed 2018 strong, with higher sales and market share for the fourth quarter and years. FCA’s total sales in the final quarter soared 16 percent, mostly on the strength of Ram and Jeep. Fourth-quarter Ram sales skyrocketed by 31 percent, largely thanks to its highly praised redesign of the 2019 Ram pickup. Jeep sales climbed 10 percent, helped by the redesigned 2019 Wrangler. Albeit small volume, Alfa Romeo sale rose 21 percent on the strength of the Stelvio utility vehicle. Dodge sales also rose 23 percent. In contrast, Fiat and Chrysler sales fell 34 and 13 percent respectively. FCA market share climbed by 1.6 percentage points in the quarter. Ram contributed to .9 percentage points of that increase. Jeep and Dodge added .4 percentage points each. 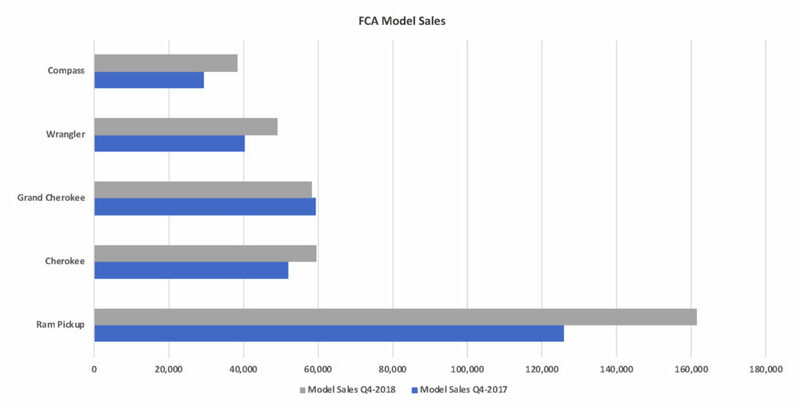 In the fourth quarter, FCA’s best-selling models and freshened models drove the automaker’s sales and market share higher. Sales of the redesigned Ram pickup soared 28 percent; Jeep Wrangler sales climbed 22 percent. Sales of affordable Jeep models, the Compass and Cherokee, were up 31 percent and 15 percent, respectively. Sales of the flagship Jeep Grand Cherokee, long in the tooth and soon to be revamped, were off despite rich incentives offered all year. 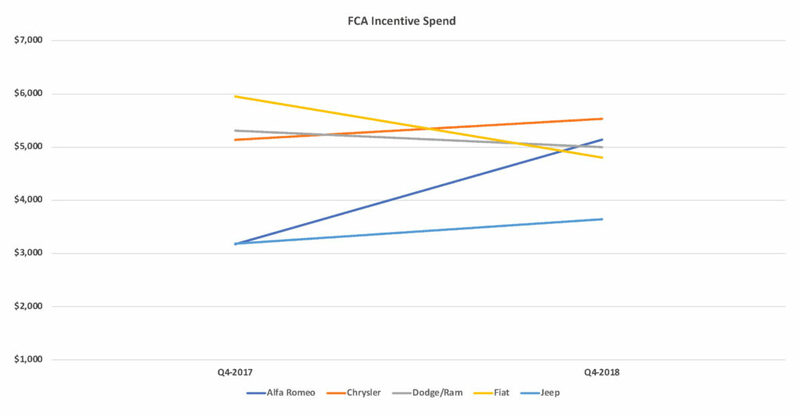 FCA boosted incentive spending in the fourth quarter by nearly 3 percent to an average of about $4,430 per vehicle. Alfa-Romeo showed the biggest hike – a hefty 62 percent – in incentive spending, which surpassed more than $5,000 per vehicle, its highest level since the brand returned to the market. Jeep spending rose 15 percent to an average of $3,641 per vehicle, with the biggest incentives on the hood of the aged Grand Cherokee. Chrysler brand incentives rose 8 percent to an average of $5,530 per vehicle as the 300 sedan carried beefy incentives all year long and the minivans, which also saw production cuts, got big ones as the year closed due to slower sales and rising inventories. Thanks to new models that need less discounts, incentives on Ram and Dodge brand vehicles dipped 6 percent, running at about $5,000 per vehicle. Fiat incentives, still high at $4,800 considering their smaller price tags, dropped 19 percent in the quarter from the more than $6,000 per vehicle in the year-ago fourth quarter. In addition to posting higher sales and market share, FCA gained in average transaction prices (ATP). Thanks to improved prices on fresh models, FCA prices were up about 5 percent to $39,787 per vehicle. The Jeep and Ram brands rose the most. The Jeep brand was up 4 percent to an average of $36,025 per vehicle. Average ram prices increased 6 percent to $48,025. Chrysler prices edged up 2 percent to an average of $37,928; Fiat up 1 percent to $23,227. Alfa Romeo and Dodge average prices fell some. By model, the Ram pickup’s ATP rose 7 percent to $49,735, surpassing Ford’s F-Series, which experienced a dip below the $50,000 mark, and the Chevrolet Silverado. The new Jeep Wrangler experienced a 14-percent gain in average transaction price over the previous one at $42,53. 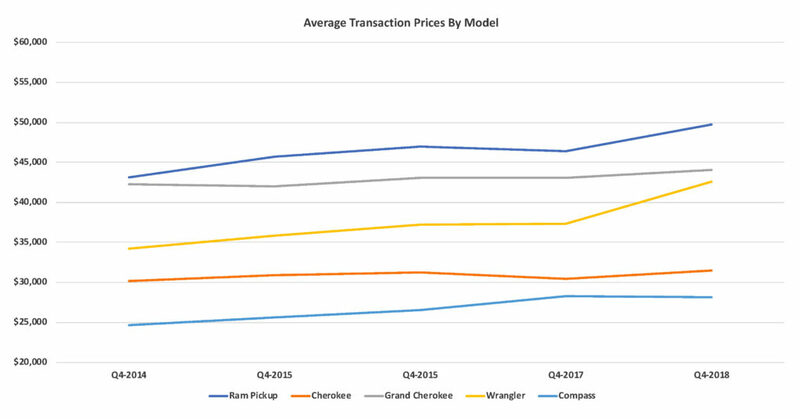 Jeep Cherokee transaction prices rose while the Jeep Grand Cherokee price dipped.